HOUSTON, June 14, 2011 -- Jiffy Lube pioneered the fast-lube category more than 30 years ago, changing the way millions of drivers service their vehicles. Today, Jiffy Lube officially introduces a new approach to oil changes that helps customers access and understand their vehicle manufacturer's recommendations, and choose the oil change schedule that is best for their needs. The new approach, called Oil Change Schedule (OCS), enables customers to choose when they will return to Jiffy Lube for their next oil change based on vehicle manufacturer's recommendations for their individual driving habits and conditions. "Jiffy Lube helped shape the industry, and being a leader means continually re-examining how we serve our customers," explained Stu Crum, president of Jiffy Lube International. "We're committed to arming drivers with the information they need to make informed decisions and create a personalized maintenance plan to help extend the life and value of their vehicles." The new approach directly engages customers in the preventive maintenance process by helping them understand what their vehicle manufacturer recommends for oil changes. This includes sharing how their driving style and conditions -- whether normal or severe -- affect their vehicle, so they can determine when to return for their next oil change. Ultimately, the process aligns the customer's oil change schedule with the vehicle manufacturer's recommendations, creating a maintenance plan to best suit individual customer needs. The new approach has been implemented in more than 70 percent of all Jiffy Lube service centers, with 100 percent system participation by the end of 2011. Select an oil change schedule of their own choosing. These options are defined by vehicle manufacturer's recommendations and the selection process is quick and easy: a Jiffy Lube customer service advisor reviews the options with the customer and the customer then selects their schedule. Customers will continue to receive a Jiffy Lube window sticker reminding them when to come back for their next oil change, based on the schedule they select. Drivers who are unsure what constitutes normal and severe driving conditions, or who want to assess their own driving style before their next oil change, can visit JiffyLube.com/education/normalvsseveredriving.aspx to learn about the differences, or they can review their owner's manual. The OCS approach was driven by the Jiffy Lube commitment to provide the optimal service experience for customers. Since the pilot program roll-out began in August 2009, reaction to the approach has been very positive. "I feel like Jiffy Lube is working with me and helping me out, and that we're a partnership," said Jiffy Lube customer, Mary Beth Mannino. "I really enjoy having them help me choose when I need to bring my vehicle in." 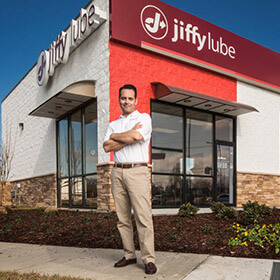 Members of the Jiffy Lube franchise community who participated in the pilot also see value in the new approach -- both for their business and customers. "OCS brings Jiffy Lube to the forefront of the industry by not only educating customers on the proper oil change schedule for their vehicle, but also helping the customer choose the schedule that is right for them," said Rick Brittain, operations manager for Lubricar, a Jiffy Lube franchise in Albuquerque, New Mexico. Jiffy Lube is dedicated to helping drivers keep their vehicles on the road and OCS helps achieve this goal. To find a Jiffy Lube in your area, please visit Locations.JiffyLube.com. Drivers can visit JiffyLube.com/education/oilchangeschedule.aspx and click on "Ready to Choose?" to determine if one or more of their local Jiffy Lube service centers are currently offering OCS.